"Grand Canary" redirects here. For the novel by A. J. Cronin, see Grand Canary (novel). For the film adaptation of the novel, see Grand Canary (film). Gran Canaria (Spanish pronunciation: [ɡɾaŋ kaˈnaɾja] meaning "Great [Island] of Dogs"), is the second most populous of the Canary Islands, an archipelago off the Atlantic coast of Northwest Africa which is part of Spain. As of 2018[update] the island had a population of 846,717 that constitutes approximately 40% of the population of the archipelago. In Ancient History, Gran Canaria was populated by the North African Canarii, who may have arrived as early as 500 BC. The Canarii called the island Tamarán ("Land of the Brave"). In the Medieval period, after over a century of European incursions and attempts at conquest, the island was conquered on April 29, 1483 by the Crown of Castile, under Queen Isabella I. The conquest succeeded after a campaign that lasted five years, and it was an important step towards the expansion of the unified Spain. Gran Canaria is located southeast of Tenerife and west of Fuerteventura. The island is of volcanic origin, mostly made of fissure vents. Gran Canaria's surface area is 1,560 km² and its maximum elevation is 1,949 metres (Pico de Las Nieves). It has a round shape, with a diameter of approximately 50 km. About 80% of the volume of the island was formed during the Miocene period eruptions, between 14 and 9 million years ago. This is called the "Old Cycle" and is estimated to have lasted some 200,000 years and have emitted about 1000 km3, mostly of fissural alkali basalt. This cycle continued with the emission of trachytes, phonolites and peralkaline rocks. This period was followed by one of erosion, which lasted some 4 million years. A second cycle of volcanic eruptions, known as the "Roque Nublo cycle", took place between 4.5 and 3.4 million years ago. This shorter cycle emitted about 100 km3. Most of the inland peaks were formed by erosion from these materials. This period also started with fissural basalts, but ended with violent eruptions of pyroclastic flows. Some phonolitic features, like the Risco Blanco, were also formed in its last stages. The third or recent cycle is held to have started some 2.8 million years ago and is considered to be still active. The last eruptions are held to have occurred some 3500 years ago. The changes in volume and, therefore, weight of the island have also caused the island to rise above the previous sea level during erosive periods and to sink during eruptive periods. Some of these "fossil beaches" can be seen in the cliff faces of the more eroded northern coast. Until the conquest, Gran Canaria had extensive forests, but then suffered extensive deforestation as a result of continuous logging, land divisions and other intensive uses. This reduced the forest cover to just 56,000 hectares, making the island the most deforested of the Canary Islands. However, in the twentieth century reforestation of the ridge of the island was begun, recovering some of the lost forest mass. Much of the summit of the island is forested mostly due to reforestation. Gran Canaria is in the autonomous community of the Canary Islands (Islas Canarias). It lies within the Province of Las Palmas, a Spanish province which consists of the eastern part of the Canary Islands community. Las Palmas de Gran Canaria is the provincial capital, one of the two capitals of the Canary Islands along with Santa Cruz de Tenerife. The island has a population of 846,717 with 378,628 (year 2018) of those in the capital city of Las Palmas de Gran Canaria. Gran Canaria is the second most populous island of the Canary Islands, after Tenerife. Gran Canaria has roads encircling the whole island and extending into the mountain areas. 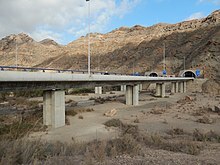 In the late 20th century, its motorways, among the first in the Canary Islands, were opened and run around Las Palmas de Gran Canaria, and were later extended to the north coast and the airport and subsequently to the south coast in response to increased tourist traffic. The high-speed motorways are GC1, GC2, and GC31, and dual carriageways GC4 and GC5. The western and the north-western parts, with the fewest inhabitants, are linked only with main roads. Public transport around Gran Canaria is provided by an extensive bus network, known in the local dialect as guaguas. The Autoridad Única del Transporte de Gran Canaria (Gran Canaria Transport Authority, TGC) manages the network and operates a number of bus stations across the island, including San Telmo and Santa Catalina bus stations in Las Palmas, Maspalomas and Galdar. Bus tickets may be purchased with cash, and AUTGC also operates a contactless electronic ticket called the TransGC Card, which is valid across the whole network. Inter-urban bus services across the island are operated by the Global bus company. Global was created in 2000 after the merger of two bus companies, Utinsa (which operated in the north of the island) and Salcai (the bus operator for the south). Local bus services in Las Palmas are run by the municipal bus company, Guaguas Municipales de Las Palmas de Gran Canaria. Gran Canaria Airport (IATA: LPA) is the only commercial airport on the island. The large number of aircraft and passengers passing through it each year make it one of the busiest in Spain. Gran Canaria is also responsible for all air traffic control in the Canaries. The most important ports in the island are the Port of Las Palmas (Puerto de la Luz), in the city of Las Palmas de Gran Canaria; Arguineguín, which exports cement from a large factory; and Arinaga, located in the main industrial zone of Canaries and one of the major ones of Spain. The main passenger ports are the Port of La Luz, where Trasmediterránea operates a weekly ferry route to Cadiz on the Spanish mainland, and the Port of Las Nieves, located in Agaete on the west side of the island, where Fred Olsen Express operates a catamaran ferry service to Santa Cruz de Tenerife. Plans for a Tren de Gran Canaria railway network linking the capital with the south have been approved by both the Gran Canaria Cabildo and the autonomous Canary Islands' Government, though the discussion with the central Spanish Government hinges now on budget. The planned 57 km railway line would run between Las Palmas and Meloneras, with the section in the capital running entirely underground as far as the suburb of Jinámar. The line is planned to have 11 stations, including an underground station at Gran Canaria Airport. The scheme was first announced in 2009, with a planned operational date in 2015. A public company called Ferrocarriles de Gran Canaria has been formed by the Cabildo's Gran Canaria Transport Authority. Plans were still being discussed in 2018. According to the Koppen Climate Classification, Gran Canaria is considered to have a desert climate (Bwh) due to its consistent warm temperatures and severe lack of precipitation. Gran Canaria is noted for its rich variety of microclimates. Generally speaking though, the average daytime high ranges from 20 °C (68 °F) in winter, to 26 °C (79 °F) in summer. Some cool nights occur in winter, but lows below 10 °C (50 °F) are unknown near the coast. Inland the climate is still mild but mountainous areas see the occasional frost or snow. Annual rainfall averages 228 mm (9.0 in), most of this falling in the cooler months, with July, August and September normally rainless. Rainfall is unevenly distributed through the island with some areas being much drier than others. Cloud cover and sunshine is often quite variable during the cooler months, and there can be several rather cloudy days at times in winter. Summers are generally quite sunny however, with the south of the island being most favoured. Gran Canaria agriculture is unique among the Canaries islands in that it was traditionally dominated by plantations, with much of these being grains as well as sugarcane, rather than by stock-breeding. The caves of Valerón (a property of cultural interest in the "archaeological site" category) in the municipality of Santa María de Guía bears testimony of it by being the largest pre-Hispanic collective granary of the Canaries. Maspalomas Lighthouse at the southern end of the island. The number of annual visitors was 3.6 million in 2014 (of which 450.000 Spaniards). Most of the tourists visit the southern part of the island. The north tends to be cooler, while the south is warmer and sunny. The east coast of the island is flat, dotted with beaches, while the western coast is rockier and mountainous. The island possesses 32 Natural Protected Spaces, notably the Rural Park of Nublo, The Doramas Jungle, the Azuaje Ravine, Tamadaba, Pino Santo, etc. In the south there is a large bird park, Palmitos Park, as well as many beach resort communities. Resorts are concentrated in the central eastern part of the southern coast in the Maspalomas area, which includes the towns of San Agustín, Playa del Inglés and Meloneras. 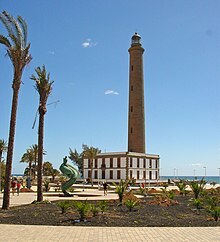 The Maspalomas Dunes are located between Playa del Inglés ("The Englishman's Beach") and the distinctive 19th century Maspalomas lighthouse. Playa del Ingles is home to the Yumbo Centre, which was opened in 1982 and has almost 200 shops, including bars, restaurants, cafes, fashion boutiques, electronic outlets and jewellery stores. Other attractions include Cocodrilos Park, Roque Nublo (an 80 m monolith), Cenobio de Valerón with more than 350 storage cavities, Painted cave of Galdar the most important archaeological park in Canary Islands, or the botanical gardens Jardín Canario (in Tafira Alta) and Cactualdea (in La Aldea de San Nicolás). El Dedo de Dios, or "God's Finger", was a rocky spire jutting from the sea in Puerto de las Nieves, and was previously the signature attraction of the Canary Islands until it was destroyed by tropical storm Delta that crossed the archipelago on November 2005. Other well-known rock formations are El Cura (also known as El Fraile), The Frog (La Rana), Roque Bentayga, the Roque de Gando, and the Peñón Bermejo. The highest peak of the island is the Pico de las Nieves, at 1,950 metres (6,400 ft). The capital city is Las Palmas de Gran Canaria. Las Canteras beach, a protected area and diving zone, lies in the heart of the city. Las Palmas de Gran Canaria is also known for its annual carnaval. It was the first stop of Christopher Columbus' expedition on his way back from the Americas, a commemoration of which is the Hermitage of San Antonio Abad, where the navigator prayed, and the Casa de Colón. Other attractions in the capital city include the Museo Canario (the most important archaeology museum in the archipelago), the cathedral and the Plaza del Espíritu Santo. In Teror the shrine of Virgen del Pino ("Virgin of the Pine"), patron saint of Gran Canaria, can be found. Its feast is celebrated on September 8. The town of Agüimes, on the eastern part of the island, has been carefully restored and its town centre, centered on its old church and a peaceful square, now evokes the quiet living of a traditional Canarian town. The district also has some of the best preserved cave dwellings, in the protected area of the Guayadeque ravine, where even the church has been built into the mountainside and visitors can find a number of popular cave restaurants. The district also includes the most renowned scuba diving area on the island: the marine reserve at the playa de El Cabrón just outside the town of Arinaga. Other important towns are Telde, known among other things for their surf schools in Salinetas, Vecindario (within the municipality of Santa Lucía de Tirajana) and Gáldar, that contains an important diving zone. In Arucas there is a Neogothic temple, popularly known as "Arucas' Cathedral", as well as a large fertile plain where bananas are grown. In Gáldar and its surroundings there is also a banana-growing plain and some remarkable archaeological remains, such as the Painted cave of Galdar or the cenobio de Valerón's communal silos, ancient tombs (among which the necropolis of Maipés), and the port of Sardina del Norte (one of the island's ports where, as in Las Palmas', Christopher Columbus used to get supplies for his ships). Four sites of scientific interest — Jinámar, Tufia, Roque de Gando and Juncalillo del Sur (total 276.2 ha). 2014 game between Herbalife Gran Canaria and Unicaja. The island is home to CB Gran Canaria – a basketball club playing in Liga ACB at the Gran Canaria Arena, with a capacity of 11,000. The island is also home to UD Las Palmas – a football club playing in Liga BBVA at the Estadio de Gran Canaria, with a capacity of 32,392. ^ ISTAC: Estadísticas de la Comunidad Autónoma de Canarias (Statistics for the Canaries) on gobiernodecanarias.org. ^ Geography and toponymy data Archived 2016-10-06 at the Wayback Machine on ign.es]. ^ a b c Araña, V and Carracedo, J.C: Canarian Volcanoes, Volume 3: Gran Canaria, pp. 8, 24. Editorial Rueda, Madrid, 1978. ^ Oscillations of up to 400 metres in the level corresponding to sea level have occurred in geological history. The highest point known is in the Bay of El Confital, Las Palmas (130m above current sea level) while subaerial materials have been extracted from a well at 230m below sea level in the area of La Aldea. Araña, V and Carracedo, J.C: Canarian Volcanoes, Volume 3: Gran Canaria, pp. 13. Editorial Rueda, Madrid, 1978. 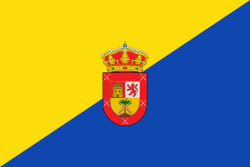 ^ a b "Government of Gran Canaria". www.spain-grancanaria.com. Retrieved 21 November 2018. ^ "Historia del Cabildo - Cabildo de Gran Canaria". cabildo.grancanaria.com (in Spanish). Retrieved 21 November 2018. ^ "Intercambiadores y Paradas Preferentes | Autoridad Única del Transporte de Gran Canaria". www.autgc.org (in Spanish). Autoridad Única del Transporte de Gran Canaria. ^ "Tarjeta TransGC". www.autgc.org (in Spanish). Autoridad Única del Transporte de Gran Canaria. Retrieved 20 November 2018. ^ "Gran Canaria - Global SU". Global SU. Retrieved 20 November 2018. ^ "Líneas y Horarios". Global SU (in Spanish). Retrieved 30 January 2019. ^ "La Empresa: Global". Global SU (in Spanish). Retrieved 30 January 2019. ^ "Guaguas Municipales | Quiénes somos". 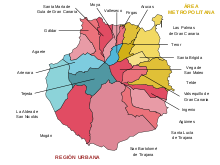 Guaguas Municipales (in Spanish). Retrieved 30 January 2019. ^ "Cadiz to Las Palmas ferry tickets, compare times and prices". www.directferries.co.uk. Retrieved 20 November 2018. ^ "Agaete to Santa Cruz de Tenerife ferry tickets, compare times and prices". www.directferries.co.uk. Retrieved 20 November 2018. ^ "Gran Canaria train details announced - Gran Canaria - Gran Canaria - ISLANDCONNECTIONS.EU". Island Connections. Retrieved 12 November 2018. ^ "Estado y Cabildo pactan cerrar los proyectos del tren en 2018". www.canarias7.es (in Spanish). Retrieved 12 November 2018. ^ "Standard Climate Values. Gran Canaria Aeropuerto". ^ "Guía resumida del clima en España (1981–2010)". Archived from the original on 2012-11-18. ^ Cenobio de Valeron, section "El yacimiento arqueologico". On arqueologiacanaria.com. ^ "Situation Of The Tourism Sector, Year Ending 2014". The Official Gran Canaria Tourist Website. Cabildo de Gran Canaria. Retrieved 12 March 2016. 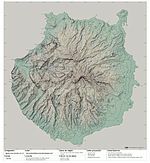 ^ a b "Espacios Naturales Protegidos de Gran Canaria Font: Gobierno de Canarias". Archived from the original on 2007-03-23. Retrieved 2007-03-14. ^ BBC NEWS - Tropical Storm Delta batters Canaries. ^ Andrews & Quintero 2007, p. 29. ^ Interactive map of Heritage sites on Grand Canary island. On estodotuyo.com, site on Heritage assets by the council of Grand Canary. ^ "Relación de los Espacios Naturales protegidos de Gran Canaria". Archived from the original on 2007-03-23. Retrieved 2007-03-14.